It appears to me that with the knowledge and wisdom we have gained by gracing ourselves on this planet, we are approaching an aging experience much like working a puzzle. Ultimately, no one can tell how the pieces will fit together, although each component is part of a meaningful whole. In order to grow gracefully, we simply need to keep working at putting it all together as best we can. So, how should we gracefully make some adjustments as we let go of our appearances, independence and abilities? At the same time, how shall we come to grips and embrace aging with open arms, as we celebrate and shae our wisdom and expertise along with our newfound abilities to spring forth and celebrate retiredliving. I'd like to toss out a few thoughts, about this aging experience and the ultimate finality of life, although I’m still trying to get from point A to point B! I believe it's critical to stay involved in life , so life will continue to have meaning and purpose. I am finding our WGOG woemn sensing this new call to rejoin life more meaningfully. Websites, groups, intentional communities, books, and the elder movement are blossoming everywhere. The Women Growing Older Gracefully events and Face Book pages have brought many fruitful connections to this community. 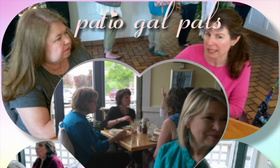 These gal pals are often committed r to support each other gracefully, with undying respect. Being alone, isolated, pondering while worrying about what might happen and not doing anything about it doesn’t make any sense to me.Unfortunately, many older persons are guilty of this behavior.Our culture has made it pretty clear that seniors have not too much to offer, although this stereotype seems to be changing. Embracing one’s age involves opening our hearts and expressing a love to friends and those in our community, as they may also be going through changes in their lives. Holding onto the prospect of aging is not about being heroic; it’s about being authentic and connecting well with others. We elders each have much to give and can discover endless opportunities to share, because holding back seems criminal. Perhaps I would do well to develop a more spiritual or philosophical approach, an intuitive sense of the meaning and purpose of aging and death. At best, I believe it quite important to take the time to trust one's own self and not become too quick to judge the aging self. Perhaps it's best to go with one's own knowing and experience about the talents and strengths we've brought into this world. Better yet, I turn to female friends I have made which have grown to nurture me through some hard times. Hopes fears and my needs as an older person seem easier to accept as part of this new adjustment, when shared with people who deeply care . This time let it be soul work that we attempt ,but not as the young everyday working woman would do. This time, let those dreams and hopes flow from within, to energize a new way to give meaning and purpose to this amazing new stage of life, as we embrace our age with joy.